Abraham Laboriel Sr. (born July 17, 1947) is a Mexican-American bassist who has played on over 4,000 recordings and soundtracks. Guitar Player magazine called him "the most widely used session bassist of our time". Laboriel is the father of drummer Abe Laboriel Jr. and of producer, songwriter, and film composer Mateo Laboriel. He is ranked No. 42 on Bass Player magazine's list of "The 100 Greatest Bass Players of All Time". Laboriel was born in Mexico City. A classically trained guitarist, he switched to bass guitar while studying at the Berklee College of Music. Henry Mancini encouraged Laboriel to move to Los Angeles, California, to pursue a recording career. His brother was Mexican rock singer Johnny Laboriel. Their parents were Garifuna immigrants from Honduras. Laboriel has worked with Al Jarreau, George Benson, Alan Silvestri, Alvaro Lopez and Res-Q Band, Alvin Slaughter, Don Felder, Andraé Crouch, Andy Pratt, Andy Summers, Barbra Streisand, Billy Cobham, Chris Isaak, Christopher Cross, Crystal Lewis, Dave Grusin, Djavan, Dolly Parton, Don Moen, Donald Fagen, Elton John, Engelbert Humperdinck, Freddie Hubbard, Phil Driscoll, Hanson, Herb Alpert, Herbie Hancock, Johnny Hallyday, Keith Green, Kelly Willard, Lalo Schifrin, Larry Carlton, Lee Ritenour, Leo Sayer, Lisa Loeb, Madonna, Michael Jackson, Nathan Davis, Paul Jackson Jr., Paul Simon, Quincy Jones, Ray Charles, Luis Miguel, Ron Kenoly, Russ Taff, Stevie Wonder, and Umberto Tozzi. When Laboriel recorded his three solo albums ‒ Dear Friends, Guidum, and Justo & Abraham, he recruited a cast of musicians that included Alex Acuña, Al Jarreau, Jim Keltner, Phillip Bailey, Ron Kenoly, and others. His son Abe Laboriel Jr. played drums. Laboriel was a founding member of the bands Friendship and Koinonia. He plays live regularly with Greg Mathieson, drummer Bill Maxwell, and Justo Almario. Laboriel is now in the band Open Hands with Justo Almario, Greg Mathieson, and Bill Maxwell. ^ Peter Meyer says: (December 27, 2010). "Video Interview: Abe Laboriel Sr". Bassfrontiersmag.com. Retrieved April 28, 2012. ^ "Open Hands - About the Band". Openhandsmusic.net. Retrieved April 28, 2012. ^ "Spectrasonics Artisans - Abraham Laboriel". Spectrasonics.net. Retrieved April 28, 2012. ^ "The 100 Greatest Bass Players". bassplayer.com. NewBay Media. 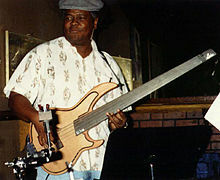 ^ "Abraham Laboriel Sr". Spectrasonics. Retrieved April 28, 2012. ^ "Johnny Laboriel dies at 71; Mexican rock 'n' roll star". Los Angeles Times. Retrieved January 15, 2015. ^ Bass Player magazine Archived February 8, 2008, at the Wayback Machine Studio Legend Recognized With Honorary Degree.